So you've reunited a fractured empire. Can you build one from the ground up? Take the role of one of history's railroad barons and see if you have what it takes to become the next Railroad Tycoon in Eagle Games new release Railroad Tycoon: The Boardgame. You can issue shares of stock in your growing company whenever you want, but remember that shareholders expect (and will receive) dividends. If you build your network without delivering some goods to generate income you may find yourself struggling to make ends meet. Railroad Tycoon: The Boardgame rewards a phased strategy. Early in the game when cash is very scarce, make short deliveries to generate some income. Build your network and expand gradually to support your bigger engines and larger network. Once you have a strong network, look for the big payoffs. Your choices are deceptively simple, build track, deliver goods, take an operations card, build an industry (urbanize) or upgrade your engine. That is it. What makes Railroad Tycoon: The Boardgame challenging is when to do these things and in what order. Remember that other players will be competing for lucrative routes as well. You may think you have a profitable network locked up, but just as it was in the early days of the Age of Steam, success breeds competition, both fair and unfair. Don't expect your opponents to idly watch as you build a powerful network in the Northeast. Resources are limited, so competition will be fierce. 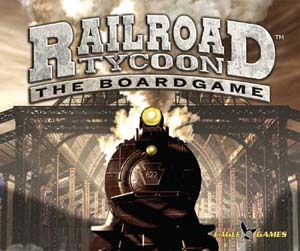 The RDG Team hasn't gotten around to writing a review for Railroad Tycoon. YET. We're writing up new reviews all the time. (And adding new games to review!) And this one is on the To Do List.